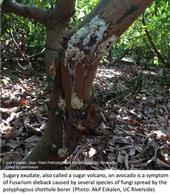 Sugary exudate on avocado tree trunk. Glenda Humiston, vice president of UC Agriculture and Natural Resources, said research is a fundamental component of the fight against damaging invasive species. The gypsy moth, an interloper from Europe and Asia, is threatening California's majestic oaks in Ventura County. Invasive desert knapweed, which comes from Africa, has made its first North American appearance in in California's Anza-Borrego Desert, where it has started to crowd out native plants. Asian citrus psyllids are slowly spreading the devastating huanglongbing disease in Southern California citrus. River rats from South America, called nutrias, are munching voraciously on wetland plants in some areas of Stanislaus, Merced and Fresno counties. Invasive species are plants, animals, fungi or microbes that are not native to an area, but can quickly establish, multiply and become pests. These species can hurt the environment, agricultural production and even human health in some instances (e.g. the mosquito Aedes aegypti). According to the USDA, invasive species are responsible for $137 billion per year in economic losses in the United States. You don't have to dig too deep into the scientific literature and popular media to find perspectives on threats posed to biodiversity in California and around the globe. Two UC Davis scientists in the Department of Wildlife, Fish and Conservation Biology have published fresh insights into endangered species in recent months. Releasing aquarium fish into local waterways — or down the toilet — can damage aquatic ecosystems in a number of ways. The fish themselves can become an invasive species, they can disrupt habitats for other fish and aquatic species, and they may introduce secondary problems such as harmful pathogens or other aquarium species (seaweed, snails) into the waterways.